People invested in flexi-access drawdown have benefited from the rise in equity markets since Brexit with the FTSE-100 index up 11.5% as the value of Sterling decreases. Equity markets have reacted positively following Brexit with Sterling falling against the Dollar from 1.50 to 1.32 improving the export prospects for UK business. The Bank of England also hinted it would reduce interest rates and introduce quantitative easing to support the economy. The FTSE-100 has increased by 697 points of 11.56% from 6,027 after the reaction to the EU Referendum to 6,724. For those that remain invested in equities before they purchase an annuity will also gain from this rise. However, at this time the 15-year gilt yields decreased and as annuity rates are primarily based on the movement of yields, rates are lower. On average annuities are 7.9% lower off-setting the rise in the value of a typical managed fund whereas people in cash would experience the full decrease in annuity income. 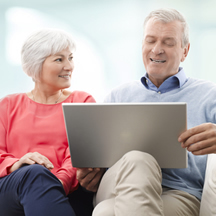 An alternative to annuities is flexi-access drawdown that allows you to keep control of your pension fund and take any level of income to meet your needs. The fund is invested in a portfolio reflecting your attitude to investment risk. 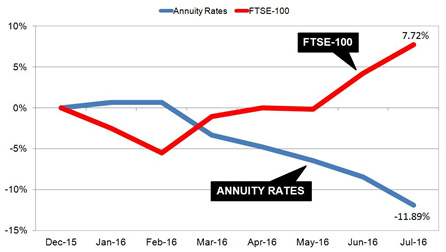 The above table shows how the FTSE-100 index has increased 7.72% during 2016 while annuity rates have decreased by 11.89%. The income taken from flexi-access drawdown is usually between 4% to 5% so the gain in the fund value would exceed the annual income to be taken in the following year. The FTSE-100 has increased by 11.56% from 6,027 after the Brexit vote to 6,724 although many funds will not be as volatile as this index and the growth would be smaller. For our benchmark a person aged 65 years old with a fund of £100,000 buying a lifetime annuity on a single life, level basis could purchase an income of £5,614 pa at the beginning of the year. The above table shows how both gilt yields and annuties have reduced during the year. With the fall in the 15-year gilt yields from 1.93% before the EU Referendum to 1.21% in July, annuity rates have reduced by £699 pa to £4,915 pa.
Over the lifetime of the annuitant based on the Office of National Statistics (ONS) we would expect a male to live for 17.3 years. This would mean he will have £12,092 less over his lifetime and for a female she can expected to live for 20.4 years decreasing her income by £14,259. Brexit has been a shock to investors creating uncertainty in the short term with a possible economic slowdown. The immediate result has been for investors to seek safe havens until the UK has a more certain future and it may take up to five years for interest rates and gilt yields to make a recovery. To avoid all time low annuity rates at retirement there are other options such as fixed term annuity and flexi-access drawdown.